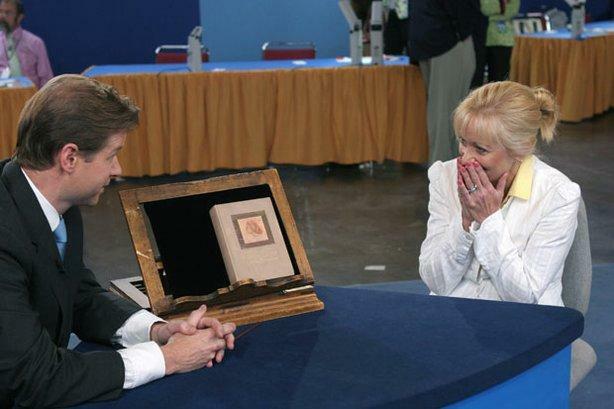 At "Antiques Roadshow" in Providence, Rhode Island, appraiser Francis Wahlgren of Christie's (left) uncovers a copy of the book "Anne of Green Gables," bought at a flea market for about $5 and since stored in an attic. The owner and her daughter fell in love with the story, having seen the series on PBS, and the owner's appreciation only intensifies as she learns the volume is a rare 1908 first edition valued at $12,000 to $18,000. 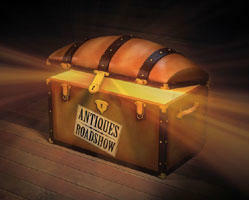 Antiques Roadshow has just announced their 2014 tour dates, and Charleston, W.Va. will be their last stop! The live event is scheduled for August 16 at the Charleston Civic Center. This is a big deal for West Virginia Public Broadcasting and for fans who've been asking for Antiques Roadshow to come to West Virginia for years. Of course, Antiques Roadshow is the PBS program where regular folks raid their attics and closets for items to be appraised by specialists from the country's leading auction houses — Bonhams and Butterfields, Christie's, Doyle New York, Skinner and Sotheby's. It also happens to be PBS's highest-rated series, seen by almost 10 million viewers each week. Admission to Antiques Roadshow events is free, but tickets are required and must be obtained in advance. Ticket applications and complete ticketing rules are available on pbs.org/antiques or by dialing toll-free 1-888-762-3749. Ticket applications must be received by Monday, April 7, 2014 at 11:59 p.m. Pacific Time. Tickets will be awarded by random drawing. West Virginia Public Broadcasting will be recruiting volunteers in the coming months -- stay tuned for more on that. For more information, go to the Antiques Roadshow website or call the Antiques Roadshow toll free number (1-888-762-3749). To get tickets to the live event, click here. For FAQ's about the show and event, click here. Forever enshrined in myth by an assassin's bullet, Kennedy's presidency long defied objective appraisal. Recent assessments have revealed an administration long on promise and vigor, and somewhat lacking in tangible accomplishment. 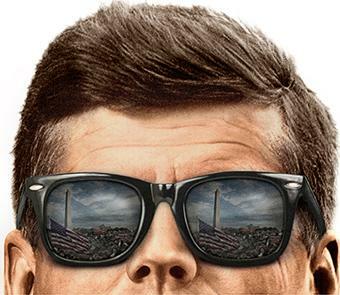 JFK: American Experience begins Tuesday, November 11 at 9 p.m. on West Virginia PBS, and concludes on November 12. Celebrate the return of Downton Abbey and dust off your favorite lucky charm--the 2014 Masterpiece Sweepstakes is here! As in previous seasons, this year’s sweepstakes offers one person the chance to win a trip for two adults from the U.S. to Britain. And new this year—four monthly prizes of a $500 shoppbs.org gift certificate. Antiques Roadshow 2014 Tour Includes Charleston, W.Va.
Antiques Roadshow, West Virginia PBS’s most-watched primetime series, has announced its Summer 2014 Tour destinations, including its first stop in West Virginia. The show is scheduled to come to Charleston's Civic Center on Aug. 16.